Melbourne graphic design agency Moo Marketing and Design recently created a series of Orientation Week brochures for longstanding client Monash College. 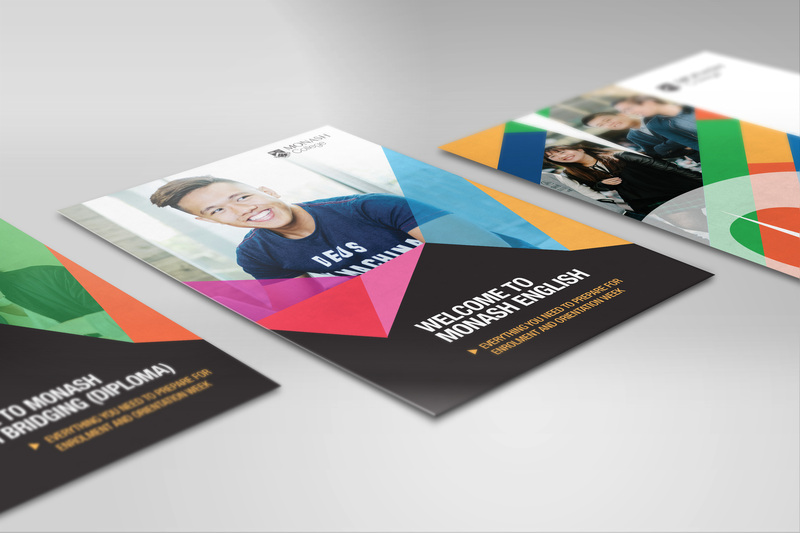 Moo’s key priority was to deliver a series of brochures that would connect with Monash College’s cohort of international students. Monash College is the preferred pathway for many international students on the road to Monash University. It provides education to students from more than 100 countries. Many are aged 16-18 and many speak English as a second language. The Moo graphic design team thus needed to create brochures that the student intake would appreciate to be fun, colourful and easy to digest. The graphic designers and marketing team saw the project through numerous stages. They performed brand application and developed design concepts. They refined concepts to fit with the A5 fold-up brochure size. The designers also stitched together eye-catching graphics, imagery and text. One of Moo’s main challenges was to populate the brochure with the required information but concurrently maintain a personality and simplicity that would resonate with Monash College’s young international students. Moo is a leading Melbourne graphic design agency with substantial creative acumen. The team also an intimate knowledge of Monash College’s student population. It has developed this knowledge over a number of years providing marketing collateral for the education provider. As Monash has previously stated, Moo is like an extension of Monash College’s internal team. Our graphic design agency services and marketing services fit well with Monash College’s dynamic branding requirements by providing efficient and adaptable graphic design services. If you’re looking for a graphic design agency in Melbourne where design is based on marketing principles and outcomes to assist with all your marketing collateral needs, try Moo.